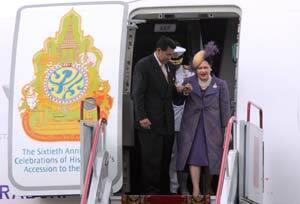 July 2, 2007 MOSCOW (AFP) - Thailand's Queen Sirikit arrived in Russia on Monday for a 10-day state visit to mark 110 years of diplomatic relations between the countries. The queen flew into Moscow at the invitation of Russian President Vladimir Putin, who is due to host a banquet in her honour on Thursday. Putin, who was in the United States for talks Monday with President George W. Bush, said in a message that he hoped the visit would "help enrich Russian-Thai relations in the long-term," ITAR-TASS reported. The visit comes four years after Putin made a state visit to Thailand. Thailand is Russia's largest trading partner in Southeast Asia with an annual bilateral turnover of 1.8 billion dollars, Russian Deputy Foreign Minister Alexander Losyukov told ITAR-TASS ahead of the visit. He said the use of Thailand as a regional centre for storing and distributing Russian oil and gas from the massive Sakhalin field in far eastern Russia was a priority in bilateral relations.